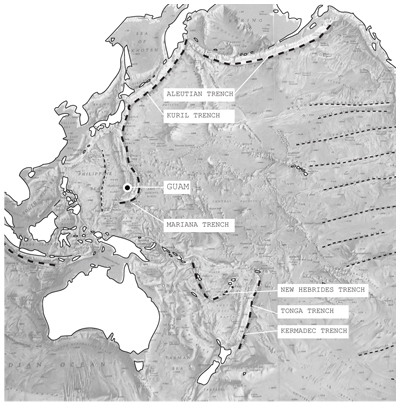 The following report is an abridged version of "Zones of Military Speleology and Laminae Along a Linear Band of Uplifted Karst in Northern Guam" to be presented at the Conference Echo Red: Military Archaeologies and Architectural Trajectories on 31 May. Geologically, Guam began as two islands. Two volcanoes erupted and collapsed in separate epochs, resulting in two land masses. We perceive it as a single island due to a second geologic process, the accretion of limestone coral which gradually fused the two volcanic formations into one. The two original islands are defined by the Pago-Adelup Fault, which bisects the island at the waist. The northern half of Guam is covered by a well lithified to friable white detrital limestone.1 The southern half is predominantly volcanic rock at the surface and contains the only rivers and streams on the island. The volcanic rock is more stable, forming what is known as the ‘volcanic basement’ of the island. Between this 'basement' and the laminae of porous coral limestone is a freshwater lens which 80% of islanders depend for their water. This lens spans the entire northern half of the island, ignoring boundaries of military and civilian space. As the military buildup underwent negotiations in 2010, civilians petitioned for equality with the military. Both sides used the rhetoric of ‘One Guam’ to profess a desire for continuity. Water infrastructure was a key point of contention, with civilians effectively arguing that the military did not do enough to protect the shared resource. A well-digging battle ensued, threatening the resource; the more wells dug, the less stable the lens became. Thus what goes on deep beneath the surface shapes the politics of the island. ‘One Guam’ was not and never will be possible because the island itself does not profess a desire to be continuous; it is in fact in a state of perpetual fracture. To understand the geologic processes we must also consider the faults, which “transect the island throughout, complicating the structure and permeability of the rock units.”2 This persistent fracturing across the volcanic and limestone layers emulates a continental process of erosion and slippage into the sea, while the island continues to grow via deposits from the numerous coral reefs at the perimeter. 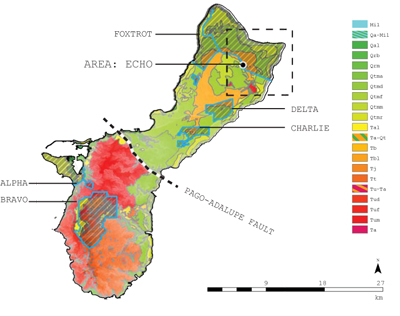 The action of faults continue to shape the island on a macro scale, but we must consider the production of new faults to which the carbonate limestone is especially vulnerable. Wherever ground runoff is able to penetrate the surface, tunnels called vadose flows will continue to open up and create larger subterranean passages. These flows from the surface and epikarst "can be concentrated by joints and fractures, resulting in their dissolutional enlargement.”4 In other words the compounding of fractures leads to the formation of caves, or speleogenesis. Speleogenesis is now occurring at a grossly accelerated rate due to the particular construction method and use of the jet noise barrier. 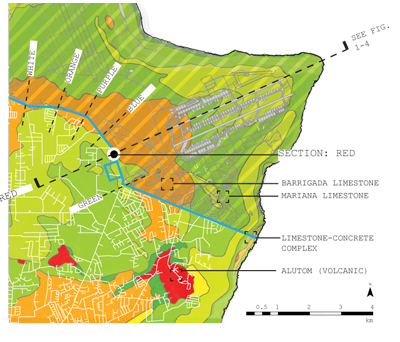 Focusing on the test sector at Echo Red, it is demonstrable that the excavation and construction of the jet noise barrier is analogous to some of the geologic processes documented by previous geologists who have studied the Marianas. The United States military is also an agent among the telluric processes of the island. Consider the buildup which began in 2014: a massive excavation tens of meters deep propagated across a linear zone tens of kilometers in length was necessary to produce both the space for the military to build in and the material in which to construct the noise-blocking berm. This massive construction effort transformed thousands of cubic meters of limestone and volcanic rock. Both were used as aggregate in the concrete which formed the shape of the jet noise barrier. 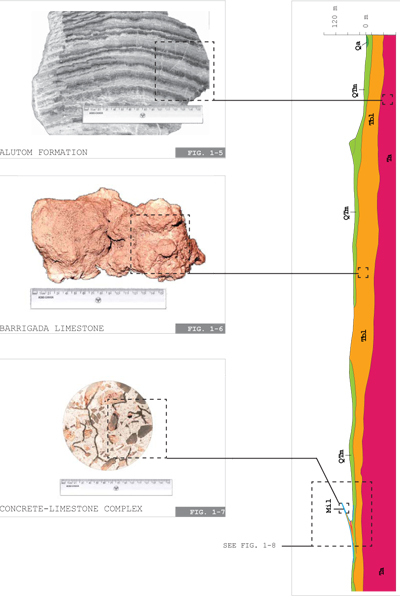 The rock composition of the jet noise barrier is both metamorphic--meaning that it has remixed the contents of the earth and erupted to produce a new mixture of stone--and sedimentary--given that the constructed landform is already returning to the stratified earth (refer to sub-section Red 5 in Fig. 1-8 below). Seventy million years of geologic history have been compressed into a microcosm of forty years of military occupation and demilitarized degradation. The island of Guernsey in the Channel Islands (known popularly in the United Kingdom as the Island of Exiled Marmite Eaters5 6) is riddled with caves and bunkers established during the German occupation of the island in WWII. The Germans built an underground hospital, multiple command centers and ammunition depots, typically beneath churches for safeguarding against air attack. The network is so pervasive that tourism has reclaimed many of the spaces due to their popularity. Residents of the island have also reported discovering new tunnel networks as they dig to build foundations or to lay new pipes in the ground. The military network of tunnels is thus an infrastructure which both has touristic benefits and domestic hazards. World War II bomb shelters and military intelligence centers at Gibraltar, Dover, Cockatoo Island, Yokosuka, and Okinawa all exhibit speleogenesis, leading in certain cases to instability in the rock composition. I have inspected these karst-tunnel networks and their geologic trajectories have been studied elsewhere. 7 Any development which builds on former military land with limestone tunnels must take special steps to accommodate geologic instability, the extent of which is often unknown and/or classified. The caves within the porous limestone were an integral part of the military program on Guam. The history dates back to the WWII use of caves, which other geologists have pointed out: “During the Second World War, Japanese garrisons modified caves for fortification, and stragglers took refuge in caves following the liberation. Live ordinance remains in many.” 8 Not much has changed in a century; the military still digs tunnels and widens caves to store munitions. Under natural geologic processes, the presence of small caves will often lead to larger phreatic chambers--voids formed by groundwater. The military has accelerated the production of phreatic chambers which usually form gradually as limestone decomposes. Instead, the voids of aircraft hangars deep below the surface were carved out of the rock to protect expensive aircraft from super typhoons which regularly sweep the Western Pacific. My team has collected measurements which suggest that micro-faults are continually forming beneath the jet noise barrier due to the partial collapse of these chambers. In order to understand how this new rock formation will behave as a stratum in the earth , I have collected samples. The purpose of these samples is to gauge the degree to which carbonic acid (produced by the presence of carbon dioxide in ground runoff) will induce separation of the calcium bonds in the limestone. 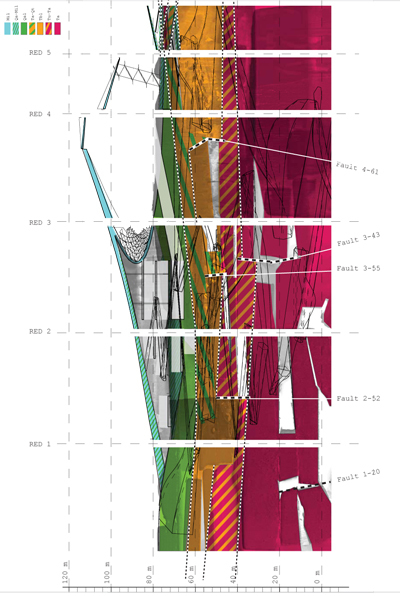 In the core sample in Fig. 1-7, we see the presence of limestone aggregate larger than 600 microns at over 75% density, with a factor of entrained air twice as large as standard concrete pours. According to the American Concrete Institute, these values will produce a significant amount of water retention, thereby accelerating the dissolution of the aggregate. For the stability consequences within the structure, please refer to the forthcoming forensic engineering report. The hollowness of the rock beneath the jet noise barrier will produce further fracturing and collapse. For this reason we must consider the region around the jet noise barrier to be unstable for permanent development. In order to reclaim the barrier for civilian use, construction must be able to accommodate slippage along faults by up to 10 meters. The National Park Service must consider that the military development has induced a state of perpetual fracture. The concrete-limestone complex will return to the soil of Guam and become nearly indistinguishable in less than 70 years, aside from the remaining fragments of reinforcing bar which will disintegrate hastily in the moist tropical environment. Entropic forces, however, are not self-propelled but require the input of energy. Lacking a force to fully eradicate the land-form, it will progressively merge with the natural features of the island. We can imagine leading school buses of children to observe a road cut, revealing the strata of various epochs: Eocene, Oligocene, late Miocene, Pliocene, Pleistocene, Holocene, and, now within the Holocene, the military lamina.